Job seekers looking for a veterinary technician position should take care to put together a well-written cover letter that compliments their resume and showcases their value as an employee. This is an example of a cover letter for a vet tech. Download the vet tech cover letter template (compatible with Google Docs and Word Online) or see below for more examples. I saw your advertisement in Veterinary World magazine this week and would like to submit my resume for the Veterinary Technician position at All Creatures Animal Clinic. I feel that my diverse background in the animal industry, combined with strong organizational and clinical skills, would make me an asset to the All Creatures veterinary team. I earned an Associate degree as a Veterinary Technician from the well known State College program, which gave me the opportunity to work with both companion animals and livestock species in a veterinary setting. In my current position, as a veterinary technician at Southside Veterinary Center, I work in a multi-doctor small animal practice. I have been professionally employed and licensed in California for the last three years and maintain membership in the California Registered Veterinary Technicians Association. I have gained significant experience assisting with surgical procedures, and I hope to qualify for specialty certification as a Veterinary Surgical Technician early next year. I would appreciate the opportunity to discuss the position with you, and I have included my resume and references for your review. Thank you for your consideration and I hope to speak with you soon. I saw your advertisement in the most recent edition of Veterinary Weekly, and I would like to be considered for the Veterinary Technician position at Eastern Equine Clinic. As a recent graduate I am well versed in current advancements in the field, and I feel that I would fit in well with the team at Eastern Equine. As a student at State College I earned an Associate degree as a Veterinary Technician, maintaining a strong 3.9 grade point average. The program at State College afforded me the opportunity to gain valuable hands-on experience with a variety of companion and livestock species, but their well known equine training program has proven to be particularly valuable. Having completed my studies, I achieved licensure as a Veterinary Technician in the state of New York and became an active member of the American Association of Equine Veterinary Technicians. After graduation I was selected for a six month internship at the prestigious Huntington Equine Clinic, a program that I will complete in just a few weeks. With this valuable practical training under my belt I am now actively pursuing a full-time career opportunity at a major equine veterinary clinic. I would greatly appreciate the opportunity to discuss this position with you in person at your convenience, and I have included my resume and reference list for your review. Thank you for your consideration and I hope to speak with you soon. Always tailor your cover letter to the job. If you are revamping a letter you used for a previous application, remember to change the addressee information, the date, and the specifics that you mention in the body of the letter (such as clinic name and where you found their job listing). Keep your cover letter to one page. A few short paragraphs should be all you need. Longer letters tend to look cluttered and do not encourage the reader to scan them for relevant details. 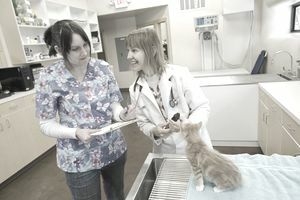 Veterinarians are usually very busy, and they tend to receive many applications for each available position. Don’t send an essay. Never use strange fonts, brightly colored paper, photos, clip art, or any sort of gimmick in an attempt to make your resume “stand out.” This almost always backfires as it appears unprofessional to the potential employer. If you are responding to an ad with a description of duties, try to mention how you have experience in those specific areas. If you don’t have direct experience with those duties, try to show how you have transferable skills. If you have any special skills, training, certifications, or licenses be sure to highlight those items in your cover letter. New graduates may want to mention participation in relevant clubs or activities, awards and honors earned, or internships completed in the field.